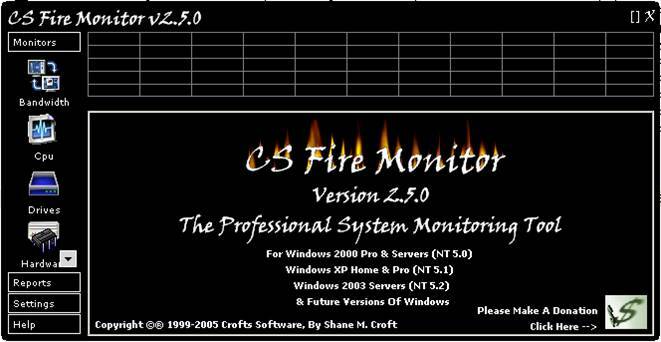 CS Fire Monitor is a comprehensive monitoring tool for the Windows 2000, Windows XP, Windows 2003, WIndows Vista & WIndows 2008 platforms. It has an extensive range of live monitoring screens that capture data from many areas within a PC and since the application has its own inbuilt database it is also capable of producing a number of reports which can be saved in a variety of ways. 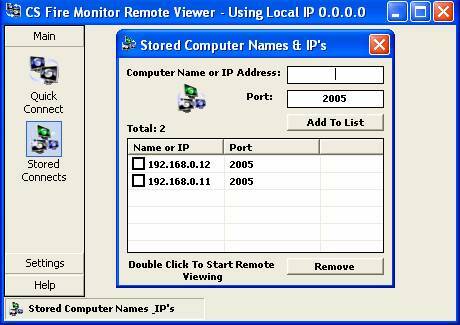 In addition, the Remote Viewer allows the user to access other PCs on the same LAN or over the Internet to extract key information. The application is highly configurable and incorporates several methods of monitoring the same information so that each user can choose the most appropriate method to meet their needs. Figure 1 above shows the initial CS Fire Monitor welcome screen. There is a Navigation Bar on the left hand side that allows access to all areas of the application with the exception of the Remote Viewer which is accessed via its own Desktop shortcut and will be explained later. Each of the main application groups is highlighted by a boxed heading and clicking on the heading expands to show the items within that group. Clicking on an item within a group highlights the selected item with a box and shows the relevant screen to the right replacing the welcome screen. The [ ] at the top right hand side of the CS Fire Monitor window maximises the application to full screen size whilst the X closes the application back to the System Tray. Figure 2 above shows the Bandwidth Monitor screen. 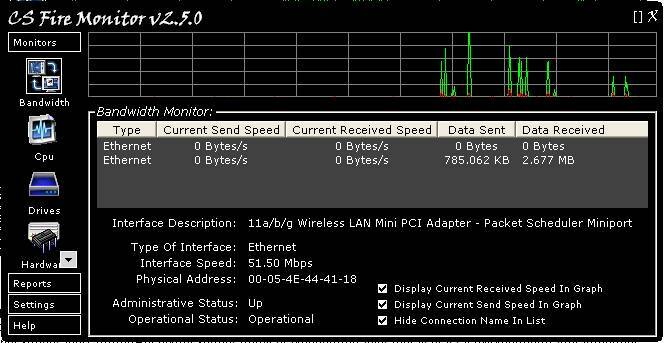 The Bandwidth Monitor table in the middle of the screen detects all connections on the PC and monitors the amount of data going to and from each connection. Current Send Speed and Current Received Speed are displayed in the table and also as activity in the graph at the top of the screen. The vertical axis of the graph is scaled according to settings within Settings->Bandwidth. The activity on the graph is stepping from right to left with each horizontal graduation representing about one (1) minute in time. Double clicking the graph expands it vertically to show more detail; double clicking again returns the graph to the original size. Right clicking the graph displays a menu allowing the graph to be cleared or saved as a bit map. The total volume of Data Sent and Data Received for each connection is also recorded and stored in the CS Fire Monitor database so that reports can be generated for Data Sent and Data Received during the current Day, over the Last 7 Days, during the current Month and the current Year. Clicking on the line for a particular connection in the Bandwidth Monitor table will provide the information shown in the lower half of the screen for that interface adaptor. The first two tick boxes in the bottom right hand corner of the screen allow the user to select whether to show Received Speed, Send Speed or both in the graph and the last tick box allows the Connection Name to be shown or hidden in the table. Figure 3 above shows the CPU Monitor screen. 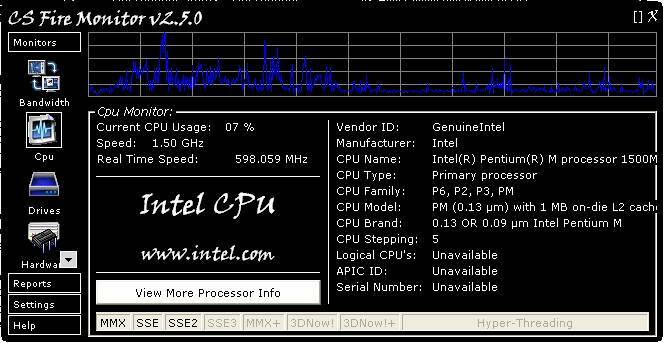 The CPU Monitor detects the current CPU usage of the PC and produces this as a graph at the top of the screen. Each vertical graduation represents 20% of CPU usage. The graph is stepping from right to left with each horizontal graduation representing about one (1) minute in time. Double clicking the graph expands it vertically to show more detail; double clicking again returns the graph to the original size. Right clicking the graph displays a menu allowing the graph to be cleared or saved as a bit map. The CPU Monitor also detects the Real Time Speed of the CPU utilising a real time clock as part of the monitor. A lot of other useful information is gathered about the installed CPU. Clicking on “View More Processor Info” reveals another screen shown in Figure 4 below. The screen in Figure 4 above has additional tabs that can be selected to reveal CPU Features, Cache and Registers. 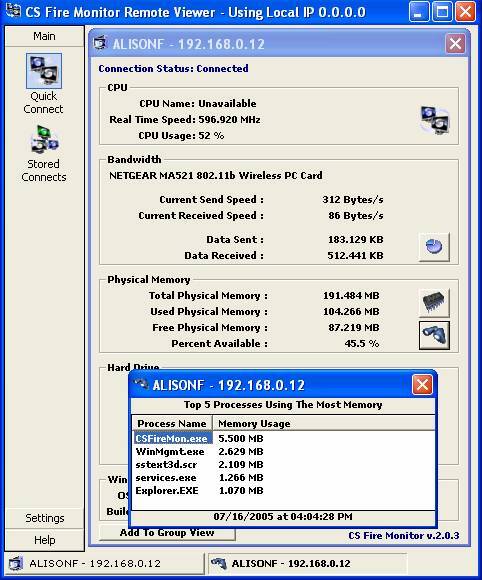 An additional tab for AMD processors shows Power Management and Address Bit information. Figure 5 above shows the Drives Monitor screen. The Drives Monitor shows the amount of used and free space of the hard drive selected in the drop down list. 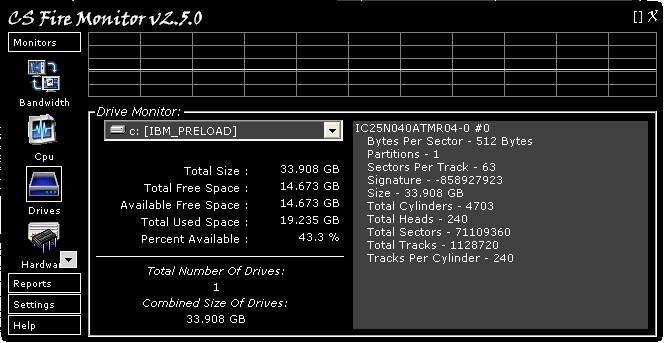 It gives detailed information for each hard drive and shows total capacity of all hard drives combined. The percent available space is also graphed at the top of the screen. Each vertical graduation represents 20% of available drive space. The graph is stepping from right to left with each horizontal graduation representing about one (1) minute in time. Double clicking the graph expands it vertically to show more detail; double clicking again returns the graph to the original size. Right clicking the graph displays a menu allowing the graph to be cleared or saved as a bit map. Figure 6 above shows the Hardware Monitor screen. The Hardware Monitor shows all hardware ever installed on the PC that Windows has managed to track. The user may see old hardware that is no longer installed but has not been formally uninstalled through Windows. The monitor also tracks any hardware that has been added or removed. It will then store the changes in the CS Fire Monitor database for future reports. The screen can be refreshed by clicking on the refresh button at the very bottom right hand corner. If the user wants to check for and list any hardware changes to be shown on the right hand side of the screen then tick the “Check For Hardware Changes On Refresh” tick box. Figure 7 above shows the IP Monitor screen. 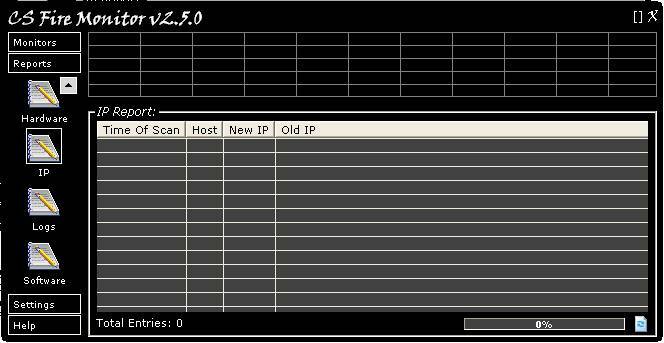 The IP Monitor displays Internet IP and/or Local IP addresses. If and when any IP address changes it stores this information in the CS Fire Monitor database. 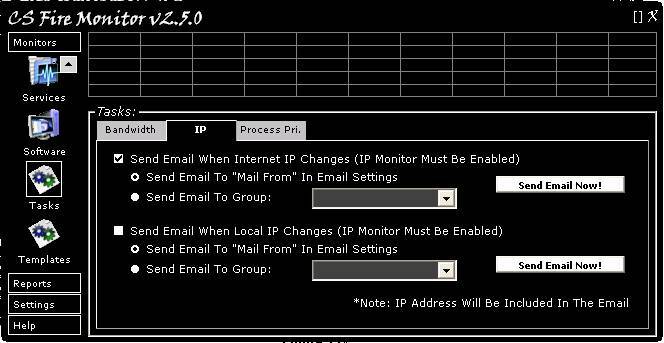 Also the user can enable the email feature within Monitors->Tasks->IP to email themselves or a group of email addresses when the IP address changes and to include the new IP address in the email. The Add and Remove buttons on the right hand side beneath the table allow the user to edit the table contents. Clicking the table headings will change the list sort order based on that particular information. 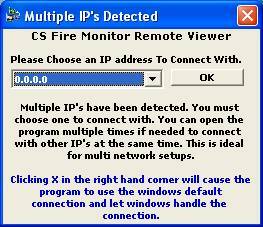 The “Enable IP Monitor” tick box must be ticked to allow CS Fire Monitor to carry out regular checking of all IP addresses. 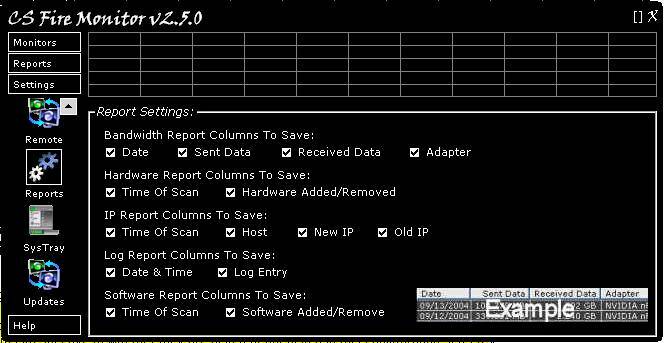 The “Scan IP Address(es) At Program Startup” tick box can be ticked to make sure that an IP scan is carried out at program startup irrespective of when the next regular scan of IP addresses was to be made. The “Address To Get Internet IP” field at the bottom left hand corner of the screen specifies the location where CS Fire Monitor obtains “My Internet IP” address from as this must be obtained from an external connection. Figure 8 above shows the Memory Monitor screen. 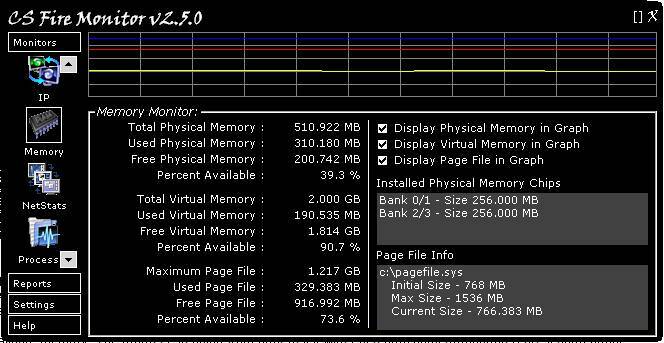 The Memory Monitor displays Physical Memory, Virtual Memory, and Page File statistics. Also shown are the physical memory chips installed and the location and size of each of these. The set of three tick boxes under the graph on the right hand side allows the user to select which of Physical, Virtual and/or Page File are shown in the graph. Each vertical graduation represents 20% of available memory. The graph is stepping from right to left with each horizontal graduation representing about one (1) minute in time. Double clicking the graph expands it vertically to show more detail; double clicking again returns the graph to the original size. Right clicking the graph displays a menu allowing the graph to be cleared or saved as a bit map. Figure 9 above shows the NetStats Monitor screen. This screen only works on Windows XP and 2003 or newer. If there is no information shown in the Monitor initially, just click on the “Refresh” button at the bottom right hand corner of the table. The screen shows all current network connections on the PC and also which programs are making those connections. This facility uses an undocumented API call that is only available from Windows XP and above. When using the NetStats Monitor it is handy to click on the [ ] symbol at the top right hand corner of the screen to enlarge the window to full size as this generally saves using the scroll bars. Clicking the table headings will change the list sort order based on that particular information. To show or hide table columns, click on the link “Show & Hide Columns” at the bottom left hand corner of the table. If you click on a particular line in the table it will be highlighted in blue and more information about that particular program will be shown at the bottom of the screen under the heading “File Information”. Clicking on the “Open Parent Folder” link will open Windows Explorer in the relevant program folder. Right clicking anywhere within the table will give options for saving the table of information. Figure 10 above shows the Process Monitor screen. 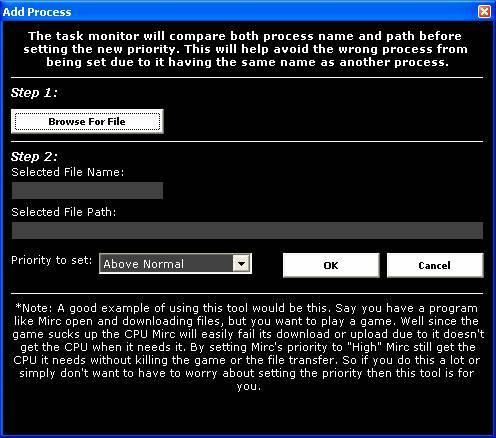 This screen shows all running processes and, by clicking on a particular process in the left had panel, detailed process information is shown in the right hand panel. When using the Process Monitor it is handy to click on the [ ] symbol at the top right hand corner of the screen to enlarge the window to full size as this generally saves using the scroll bars. Right clicking on any particular process in the left had panel brings up a menu that allows the user to, amongst other things, End or set the Priority of the process. Figure 11 above shows the Services Monitor screen. This screen shows all services running on the PC. When using the Services Monitor it is handy to click on the [ ] symbol at the top right hand corner of the screen to enlarge the window to full size as this generally saves using the scroll bars. To refresh the Services Monitor click the “Refresh” button at the bottom right hand corner of the screen. Clicking the table headings will change the list sort order based on that particular information. Double clicking a particular process will open a supplementary screen with more details of that process as illustrated in Figure 12 below. Right clicking on any particular service in the Services Monitor screen brings up a menu that allows the user to, amongst other things, Start, Stop, Pause or Resume a service or change the Startup mode. Figure 13 above shows the Software Monitor screen. This screen monitors all currently installed software. 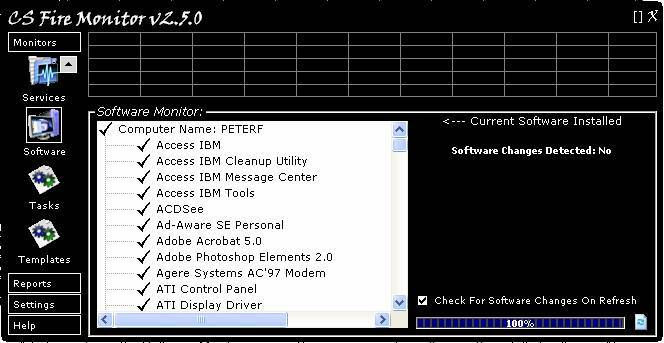 Also the Software Monitor tracks any software that has been added or removed. It will then store the changes in the CS Fire Monitor database for future reports. To refresh the monitor just click on the “Refresh” button at the bottom right hand corner of the screen. If the user wants to check for and list any software changes to be shown on the right hand side of the screen then tick the “Check For Software Changes On Refresh” tick box. Figure 14 above shows the Tasks Monitor screen. 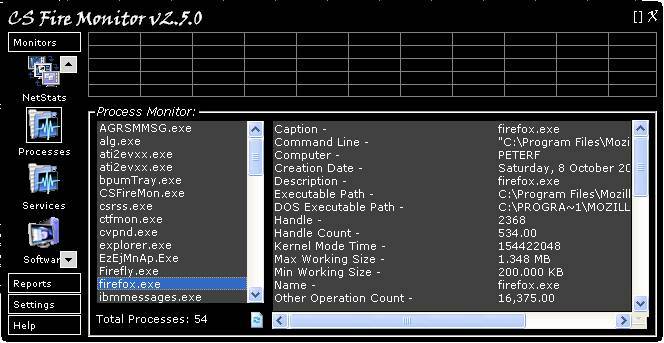 This screen allows the user to set up a number of Tasks that can be carried out when certain events are detected by CS Fire Monitor. There are three (3) tabbed screens; the first called “Bandwidth” (shown in Figure 14) and two more called “IP” and “Process Priority”. 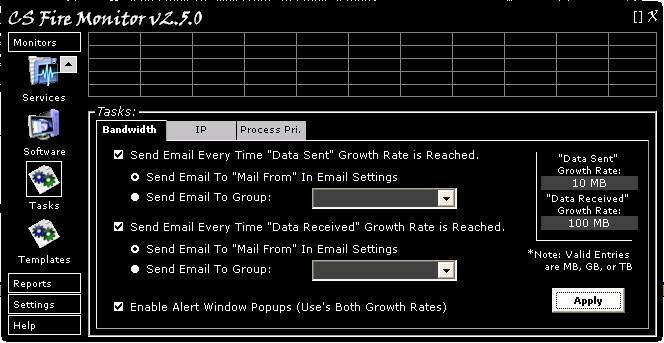 The “Bandwidth” tab allows the user to email themselves or a group of email addresses each time that the total “Data Sent” exceeds a preset increment as defined in the field at the top right hand corner of the screen (10 MB in the example shown). To activate, the tick box must be ticked and the radio button set for the appropriate email to be sent to themselves or a group of email addresses. 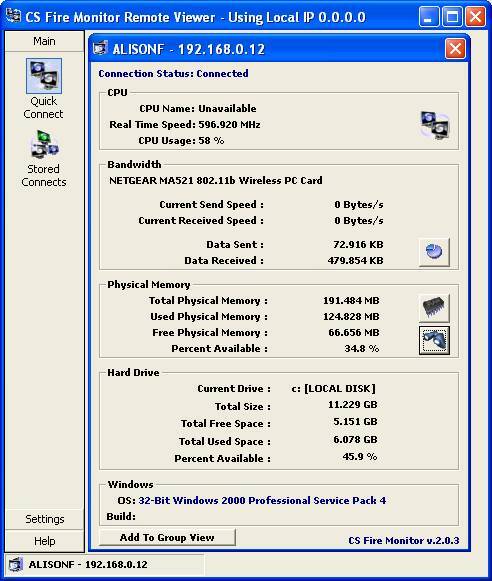 Similarly, each time the total “Data Received” exceeds a preset increment as defined in the second field at the top right hand corner of the screen (100 MB in the example shown). 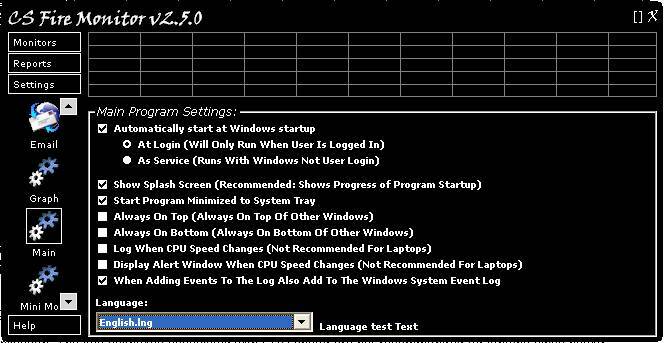 In addition, Alert Window Popups (appearing above the System Tray) can be activated when either of the preset Data increments is exceeded. This is achieved by ticking the tick box at the bottom of the screen. After all the above settings have been made, click the “Apply” button at the bottom right hand corner of the screen. 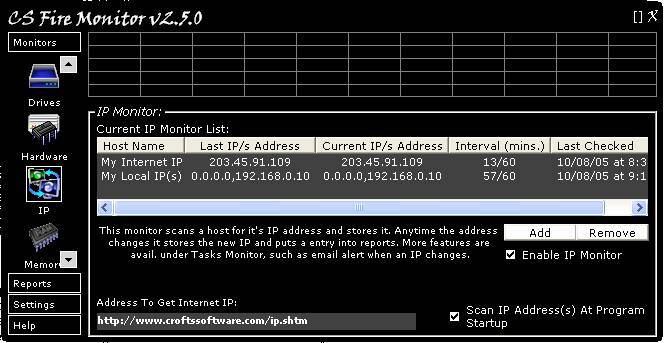 Figure 15 above shows the “IP” tab in the Tasks Monitor screen. The IP tab allows the user to email themselves or a group of email addresses each time that any Internet IP or Local IP address changes. To activate either, the tick box must be ticked and the radio button set for the appropriate email to be sent. Test emails can be sent by clicking on the “Send Email Now!” buttons. 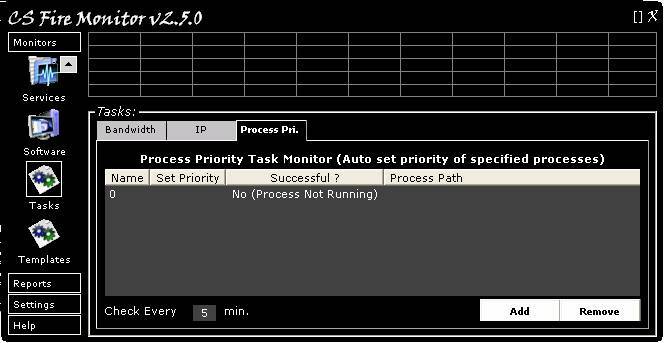 Figure 16 above shows the “Process Priority” tab in the Tasks Monitor screen. The user can add and remove programs for which the priority can be pre-determined by clicking on the “Add” and “Remove” buttons at the bottom right hand corner of the screen. The “Add” button opens a screen as shown below in Figure 17. The screen in Figure 17 above allows the user to select a program and preset the priority. The “Remove” button on the main screen (Figure 16) allows a highlighted program in the table to be removed. The time interval in the “Check Every” field can also be adjusted by the user. Figure 18 above shows the Template Monitor screen. This screen allows various reports to be listed so that they can be either saved as and when required, by clicking on the “Save List Now” button, or on a regular basis by ticking the “Enable Auto Save” tickbox and setting an appropriate time interval in the “Auto Save Every” field. If the user wants to refresh the information for each report before saving, then the “Auto Refresh Reports” should also be ticked. Templates work by CS Fire Monitor loading the nominated template and reading the template for keywords. Once a keyword is found the keyword is replaced with the current data equivalent to that keyword. Text in the template and the data information required are then saved to the output file. The user can make up their own templates and place them in the “templates” folder within the CS Fire Monitor program folder. 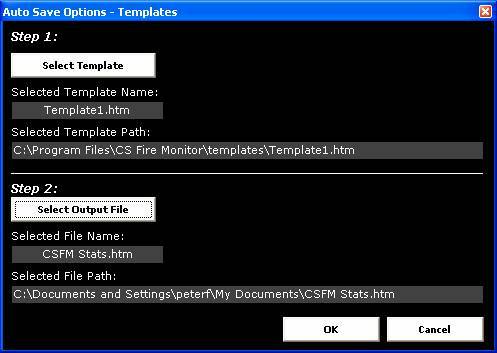 The user can find and open the file “Template1.htm” in the “templates” folder within the CS Fire Monitor program folder and get the idea. Templates do not have to be “htm” files; they can be just plain “txt” files if that is simpler. The keywords for templates are listed in the Appendix at the end of this Help File. Clicking on the “Add” button brings up the screen shown in Figure 19 below. Figure 19 above shows the screen for selecting report templates and specifying output file locations. 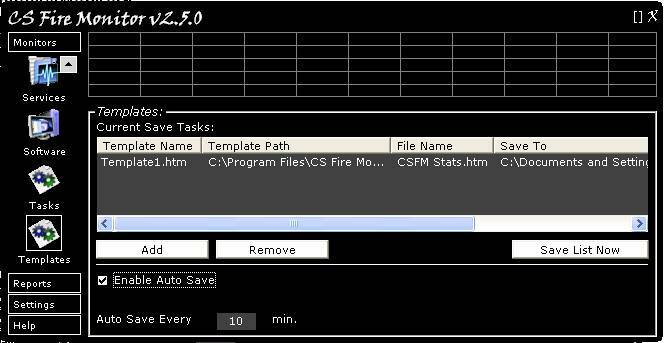 First click on the “Select Template” button which allows selection of an appropriate template from the “templates” folder within the CS Fire Monitor program folder and then click on the “Select Output File” which allows the user to nominate an output file name and the destination for that file. Each time a save or “Auto Save” action occurs the existing output file of the same name is written over with the updated information. 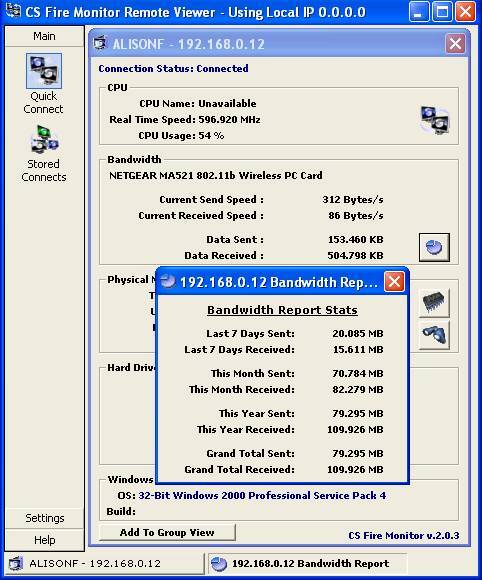 Figure 20 above shows the Bandwidth Report screen. When using the Bandwidth Report it is handy to click on the [ ] symbol at the top right hand corner of the screen to enlarge the window to full size as this generally saves using the scroll bars. Clicking table headings will change the list sort order based on that particular information. An added feature in this particular report is that the Date sort order is remembered from one access to the next so that it is always displayed the same way. Right clicking anywhere within the table will bring up a menu allowing the information to be saved in a variety of formats. The option of displaying Sent Data and Received Data on the basis of Daily, Monthly or Yearly is set by the row of radio buttons just under the table. If the selection is changed then it is necessary to refresh the report by clicking on the “Refresh Report” button at the bottom right hand corner of the screen. This key report has its own set of auto save options accessed via the “Auto Save Options” button at the bottom left of the screen. Clicking on this button opens the screen shown in Figure 21 below. 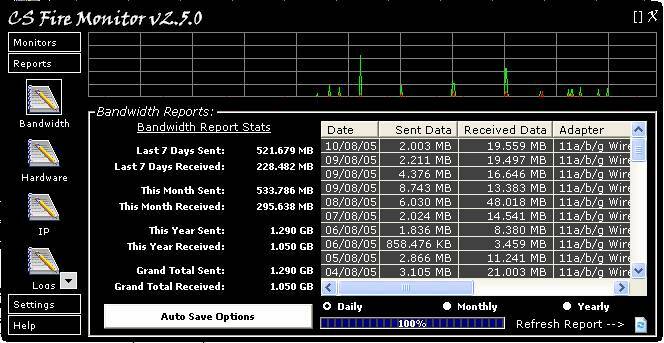 Figure 21 above shows the Auto Save Options screen for the Bandwidth Report. A new report can be created by using the “Add” button to open the screen shown in Figure 22 below. Figure 22 above shows the “Add New Save Option” screen for the Bandwidth Report. Clicking on “Save As” allows the user to nominate a file name and specify a location for the Bandwidth Report. The file format can also be specified at that time (using the “Save as type” drop down list) or separately by using the “Format” field at the bottom of the screen shown in Figure 22. Note that the template for the Bandwidth Report is preset in CS Fire Monitor so there is no need for the user to select a template. Once all settings have been made click on the “OK” button and the new File Name, Format and Save To information should be listed in the screen shown in Figure 21 above. Unnecessary or old reports can be removed by highlighting them in the table and clicking on the “Remove” button. The Bandwidth Report(s) can be saved on demand by clicking the “Save All Now” button on the screen shown in Figure 21 or alternatively the Auto Save function can regularly save the Bandwidth Report by ticking the box in the bottom left hand corner and selecting an appropriate time interval in the “Auto Save Every” field. Note that previous Bandwidth Reports will be overwritten every time a new report with updated information is saved. Figure 23 above shows the Hardware Report screen. This Report shows the date and time when any new hardware was installed or when any hardware was removed. The Report can be refreshed by clicking on the “Refresh” button at the bottom right hand corner of the screen. Right clicking anywhere within the table will bring up a menu allowing the information to be saved in a variety of formats. Figure 24 above shows the IP Report screen. This Report shows the date and time when there was a change to either the Internet or Local IP address. The Report can be refreshed by clicking on the “Refresh” button at the bottom right hand corner of the screen. Right clicking anywhere within the table will bring up a menu allowing the information to be saved in a variety of formats. Figure 25 above shows the Logs Report screen. This Report shows the date and time when there was any change to the CS Fire Monitor program. The Report can be refreshed by clicking on the “Refresh” button at the bottom right hand corner of the screen. Right clicking anywhere within the table will bring up a menu allowing the information to be saved in a variety of formats. Figure 26 above shows the Software Report screen. This Report shows the date and time when any new software was installed or when any software was removed. The Report can be refreshed by clicking on the “Refresh” button at the bottom right hand corner of the screen. Right clicking anywhere within the table will bring up a menu allowing the information to be saved in a variety of formats. Figure 27 above shows the Bandwidth Settings screen. The first option is for the setting of Bandwidth Speed in bytes per second or bits per second. Note that only Bandwidth Speed has this optional setting; all data volumes are in bytes. The fields labelled “Received Max” and “Send Max” relate to the vertical axis scale of the graph showing Bandwidth Speed in the Bandwidth Monitor. Note these entries are in kilobytes per second. The next tickbox allows the user to ignore the “MS TCP Loopback Interface”; the default is that this interface is ignored. The drop down list allows the user to select which interface connection is shown as default in the Bandwidth Speed graph in the Bandwidth Monitor. The “Add” and “Remove” buttons at the bottom of the screen allow the user to select connection interfaces for which data does not need to be collected in the CS Fire Monitor database and hence not to be shown in any of the reports. This enables blank lines corresponding to unused connection interfaces to be eliminated from reports. Clicking on the “Add” button brings up the screen shown in Figure 28 below. Figure 28 above shows the Adaptor Not to Store screen. The user can click on the drop down list and select an adaptor to be excluded from the data gathering process. If already collected data from this adaptor needs to be eliminated from the database then place a tick in the tickbox. When “OK” is clicked the adaptor will be listed in the field at the bottom right hand side of Figure 27. Adaptors can be removed from this list by highlighting and clicking the “Remove” button. Figure 29 above shows the Colours Setting screen. This screen allows the user to customise the CS Fire Monitor colour scheme and is basically self explanatory. Colours can be changed by clicking in the coloured square and selecting a colour from the Windows palette. The “Smooth Progress Bars” tickbox removes the graduations from the progress bars on various screens. 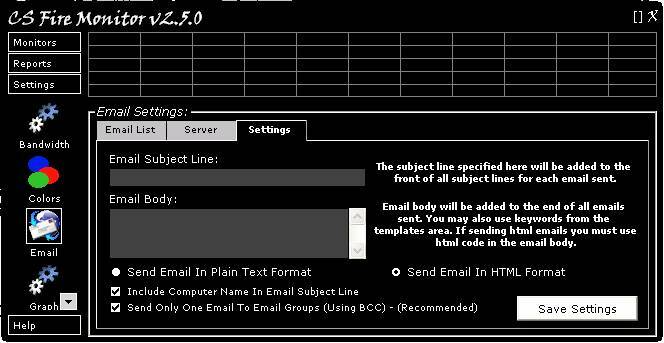 Figure 30 above shows the Email Settings screen. There are three (3) tabbed screens; the first is called “Email List” (shown in Figure 30), the second is called “Server” and the last is called “Settings”. 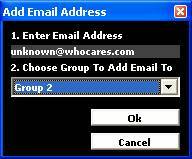 The “Email List”” tab allows the user to set up email groups and add and remove email addresses from these groups. This is achieved by using the buttons down the right hand side of the screen. Each of these buttons opens one of the self explanatory subsidiary screens as shown in Figure 31 below. Clicking on the “Server” tab in the Email Settings screen (Figure 30) opens the screen shown in Figure 32 below. This screen allows the user to nominate an SMTP server for originating emails and also allows the “Mail From” address to be specified. Examples of the format required are shown under each of the top two fields. If the SMTP server nominated requires authentication then the type of authentication must be selected from the drop down list headed “Type” and the username and password must be entered into the corresponding fields shown as “Username” and “Password”. When you have made the appropriate entries click on “Save Settings”.The radio buttons allow the user to select the email format; Plain Text or HTML. The tick boxes at the bottom of the screen allow the user to firstly include the PC name in the email subject line and secondly, the option to send only one email to groups by including all email addresses within the group in the BCC field of the one email. Clicking on the “Settings” tab in the Email Settings screen (Figure 30) opens the screen shown in Figure 33 below. This screen allows the user to customise the contents of all email subject lines by entering the desired text into the “Email Subject Line” field. Additional text can be included in the body of the email by entering the desired text into the “Email Body” field. The Email Body text can include keywords that will replaced with the equivalent data when the email is generated. The radio buttons allow the user to select the email format; Plain Text or HTML. The tick boxes at the bottom of the screen allow the user to firstly include the PC name in the email subject line and secondly, the option to send only one email to groups by including all email addresses within the group in the BCC field of the one email. 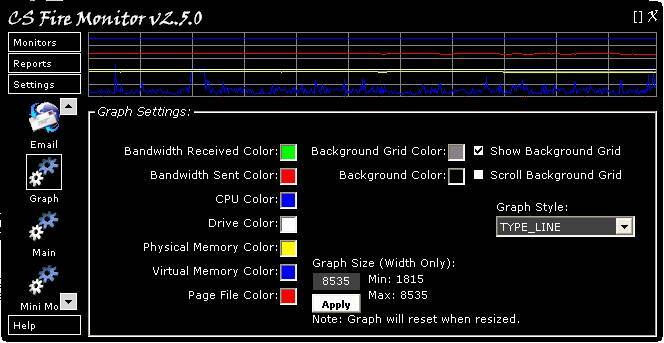 Figure 34 above shows the Graph Settings screen. 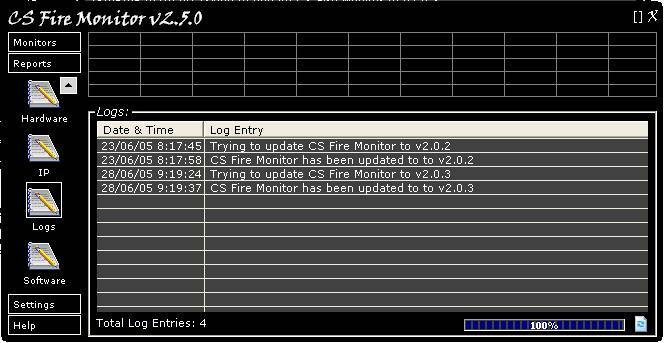 This screen allows the user to customise the CS Fire Monitor graph and is basically self explanatory. Colours can be changed by clicking in the coloured square and selecting a colour from the Windows palette. The graph width can be adjusted between 1815 and 8535. The tickboxes allow the user to turn on or off the background grid or the grid scrolling effect. The graph style can be selected using the “Graph Style” drop down list. Figure 35 above shows the Main Settings screen. Most of these switches are self explanatory. The radio buttons under the first item allow the user to select whether CS Fire Monitor runs as a service or as a logged in user application. The two tickboxes associated with CPU speed are not recommended for laptops since the power management continuously changes CPU speed to conserve battery power. The language used for text within CS Fire Monitor can be set using the drop down box at the bottom of the screen. Selected Mini Monitors can be moved around the screen to any convenient location. In addition, Mini Monitors can be made partially transparent (Transparent Mode) but still movable by dragging or they can be made ghosts (Ghost Mode with Transparent Mode) such that the user can “click through” the Mini Monitor to the underlying application window. When in Ghost Mode the Mini Monitor cannot be dragged around the screen; Ghost Mode must be turned off before the Mini Monitors can be moved. The first tickbox on the Mini Monitor Settings screen (Figure 36) is a fairly standard option to enable the Mini Monitors to always be on top of other application windows. When using this setting, the topmost attribute is occasionally lost and, without Ghost Mode enabled, the attribute can be retained by simply clicking on it. However, if Ghost Mode is enabled, then clicking on it will not work and hence the “Reapply Topmost Attributes” option in the Mini Monitors menu found by right clicking the icon in the System Tray and selecting “Mini Monitors”. The second tickbox is to enable the system wide hotkeys that are detailed on a subsidiary screen found by clicking on the question mark button found alongside this option. 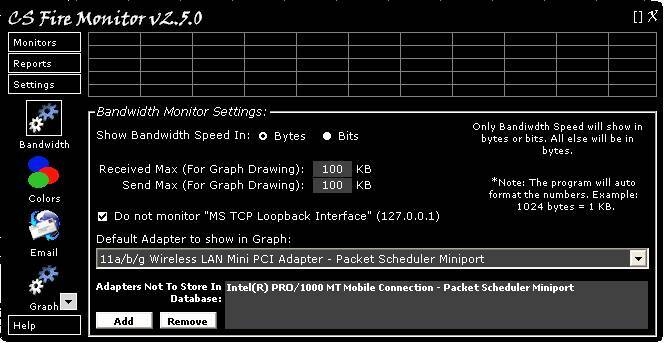 The third tickbox allows the user to select whether the bandwidth Mini Monitor shows Data Sent and Received data volumes rather than Data Sent and Received speeds. The fourth tickbox enables Transparency Mode for the Mini Monitors and allows the transparency level to be set. The fifth tickbox enables Ghost Mode (with Transparency Mode) for the Mini Monitors and allows the transparency level to be set. Figure 37 above shows the Misc. Settings screen. 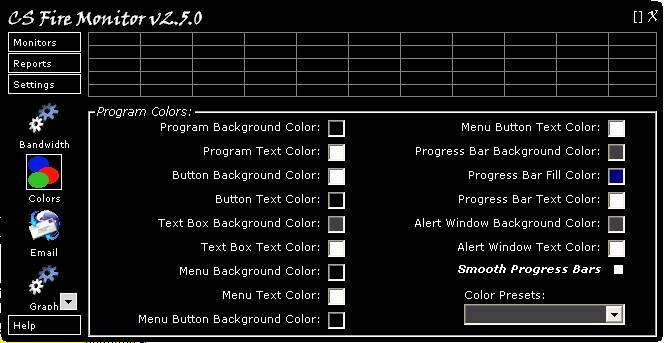 The first group of tickboxes entitled “Fade In & Out Effects” at the top left of this screen enable fade in and out of the main program screen. The fade time can be adjusted. 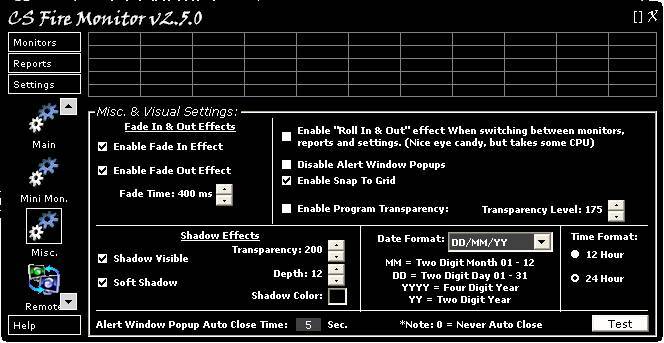 The group below that entitled “Shadow Effects” enables shadow for the main program screen. Transparency, depth and colour of the shadow can also be set. The last item on the left hand side sets the visible time for the Alert Window Popup and allows you to test the effect by clicking on the “Test” button. The tickboxes in the top right hand corner of the screen are a miscellaneous group of options that are basically self explanatory. Try clicking the “Roll In & Out” effect tickbox and see what happens when you try navigating between items within the Settings group. The “Disable Alert Window Popups tickbox does exactly as it states. This option can also be set by right clicking the CS Fire Monitor System Tray Icon and selecting “Disable Alert Popups”. The “Enable Snap To Grid” tickbox makes alignment of the Mini Monitors easier. The “Enable Program Transparency” tickbox allows the main program screen to be transparent with the level set by the up and down arrows to the right. The “Date Format” drop down list and the “Time Format” radio buttons allow the user to select their favourite date and time formats to be used throughout CS Fire Monitor. Figure 38 above shows the Remote Settings screen. This screen can also be accessed by right clicking the CS Fire Monitor icon in the System Tray and then clicking on “Remote View Settings”. 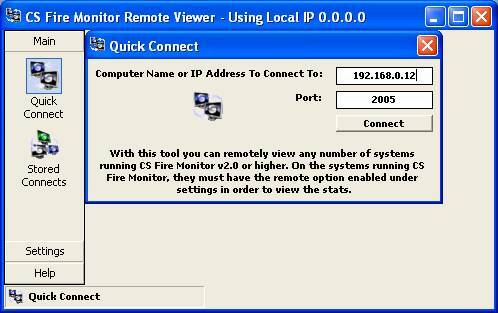 The first tickbox in the screen enables the remote feature and allows others to use the CS Fire Monitor Remote Viewer to access this PC to obtain certain statistics. Details of any connection currently accessing this PC would be listed in the table at the bottom left hand corner of the screen. If the user only wants certain IP addresses to access using this function then tick the box labelled “Only Let Allowed IP’s Connect” and then right click in the column headed “Allowed IP’s” and enter the appropriate IP address(es). If the user just wants to ban certain IP addresses from using this function then untick the box labelled “Only Let Allowed IP’s Connect” and then right click in the column headed “Banned IP’s” and enter the appropriate IP address(es). 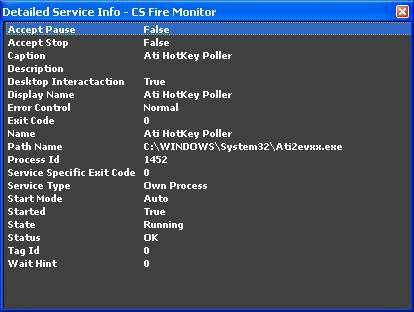 The CS Fire Monitor Remote Viewer will be described later in more detail under its own heading. Figure 39 above shows the Report Settings screen. This is a simple configuration screen that allows the user to select which items of information should be written to the Reports. This applies to the Reports within CS Fire Monitor and those saved or auto saved to file using templates. The CS Fire Monitor database stores all these items irrespective of whether they are ticked or not ticked in this configuration screen. 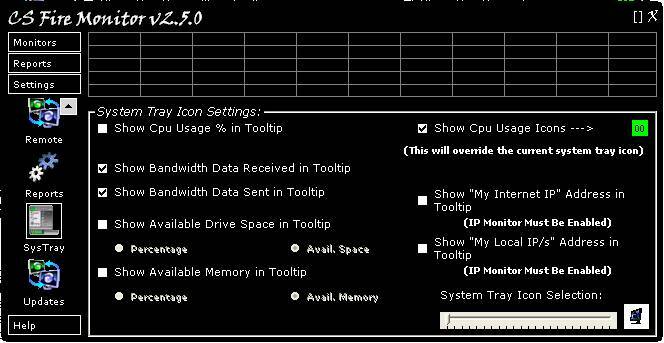 Figure 40 above shows the System Tray Icon Settings screen. If the top tickbox on the right hand side labelled “Show CPU Usage Icons” is unticked, the CS Fire Monitor System Tray Icon can be selected using the slider at the bottom right hand corner of the screen. There are 22 possible CS Fire Monitor icons to choose from. Ticking the top tickbox on the right hand side labelled “Show CPU Usage Icons” replaces the selected icon with a green rectangular icon containing the CPU occupancy in percent. The rectangular icon changes colour to orange when CPU occupancy exceeds 90% and changes to red when CPU occupancy exceeds 95%. If the cursor is placed over the CS Fire Monitor System Tray icon a Tooltip comes up that can show a variety of information. The remaining options in the System Tray Icon Settings can be selected or not depending on what information is required to be shown in this Tooltip. Figure 42 above shows the “About” screen which is basically the same as the initial welcome screen. 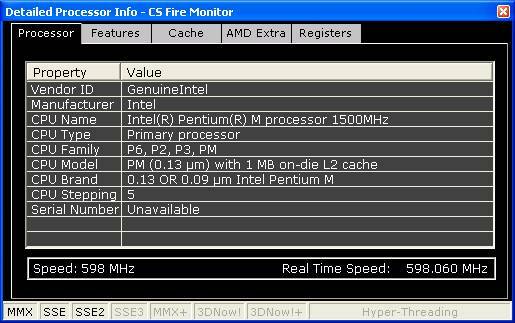 This screen shows the current version of CS Fire Monitor. Donate By PayPal Thanks very much! 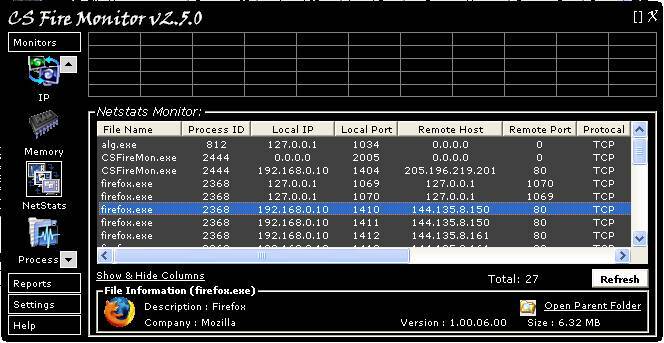 If the Remote Viewer senses that there is Multiple IPs available it will show the screen in Figure 43 below. The user can either select one of the IP addresses in the drop down list and click “OK” or just close the window with the X in the top right hand corner and the Remote Viewer will use the Windows default connection. The screen in Figure 44 below should then come up. The user can then click on the “Quick Connect” icon under the “Main” heading in the navigation bar on the left hand side to get the screen shown in Figure 45 below. Enter the IP address of the PC to be monitored and click on “Connect”. The next screen that comes up should look something like the one in Figure 46 below. Most of the information shown on the subsidiary screen labelled “ALISONF – 192.168.0.12” in Figure 46 is self explanatory. Clicking on the “Show Bandwidth Totals From Bandwidth Reports” button (picture of a pie-chart) at the bottom right hand corner of the section titled “Bandwidth” provides the additional superimposed screen of information shown in Figure 47 below. There are two more buttons in the “Physical Memory” section of the subsidiary screen in Figure 46. The first of these looks like a picture of an Integrated Circuit and is the “Clean System Memory” button; an action that takes approximately 5 seconds. The second button in the “Physical Memory” section, with a picture of binoculars on it, is the “List Top 5 Memory Using Processes” button. Clicking this button gives the additional superimposed screen shown in Figure 48 below. At the bottom of the screen shown in Figure 46 there is a button labelled “Add To Group View”. 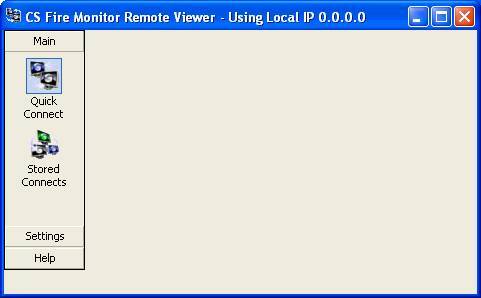 Clicking on this button adds the PC the user is currently monitoring to a “Group Remote View” screen as shown in Figure 49 below. This feature allows the user to monitor a number of PCs from the same screen. 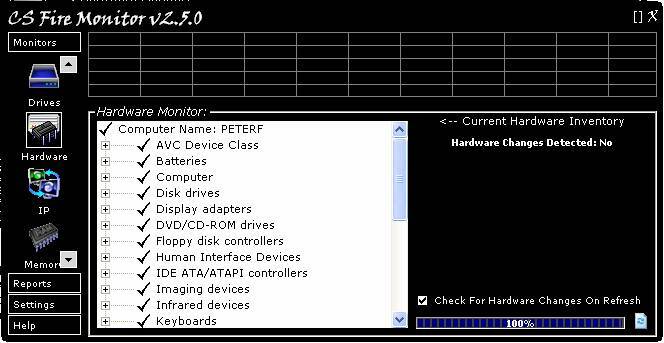 An individual PC can be selected by highlighting and then the buttons for Bandwidth Information, Clean System Memory and Top 5 Processes can be used from the Group Remote View screen for that particular PC. Instead of using the using the “Quick Connect” screen as in Figure 45, the user can also connect to a remote PC by clicking on the “Stored Connects” icon under the “Main” heading in the navigation bar of the screen in Figure 44. This opens the screen as shown in Figure 50 below. To connect to an already stored computer IP address it is only necessary to double click the IP address shown in the “Stored Computer Names & IP’s” table. Additional IP addresses can be added to this table by entering the IP address in the field at the top right hand corner of the “Stored Computer Names & IP’s” screen and then clicking on “Add To List”. Unwanted IP addresses in the list can be removed by highlighting the IP address and then clicking on the “Remove” button at the bottom right hand corner of the screen. 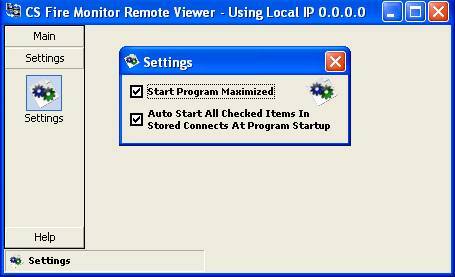 If the user wants to automatically open connections to certain PCs when CS Fire Monitor Remote Viewer is started then it is necessary to go into “Settings” screen from the navigation bar in Figure 44 and tick the item “Auto Start All Checked Items in Stored Connects At Program Startup” (see Figure 51 below). 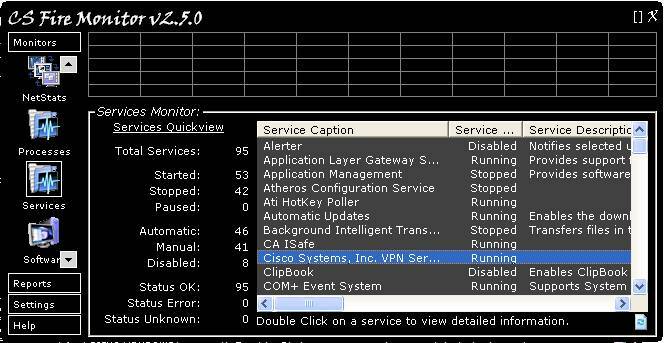 Then in the “Stored Computer Names & IP’s” screen shown in Figure 50 tick the boxes next to the IP address(es) for those PCs that the user wishes to automatically connect to when opening CS Fire Monitor Remote Viewer. The “Start Program Maximised” option in the “Settings” screen shown in Figure 51 is self explanatory. The “Help” icon in the navigation bar of the CS Fire Monitor Remote Viewer” screen in Figure 44 contains an “About” icon that opens a screen to show the version number of the CS Fire Monitor Remote Viewer. 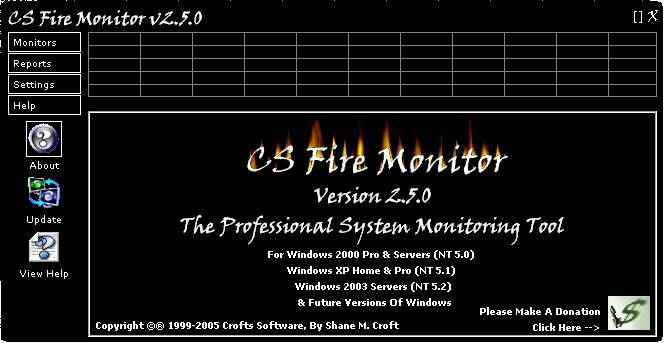 The CS Fire Monitor can be used as a Windows screen saver. To set this up the user needs to go into the Windows “Display Properties” in the usual way and then find “Csfiremon” in the Screen Saver drop down list and select it. Note that CS Fire Monitor program must be running for the screen saver to get the necessary data.